Probably the most common and most visible microfauna of the reef aquarium are the amphipods of the Gammarus genus. 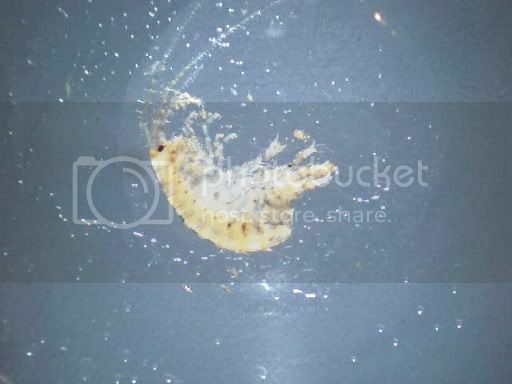 There are over 200 different types of Gammarus amphipods and, although I have never looked into which species are the most prevalent in our aquariums, I can certainly recognize one when I see it. The amphipod is one of three members of the group that most marine aquarists refer to as simply "pods", the other two being isopods and copepods. All three of these are crustaceans and are imported into our systems in live rock, live sand, marine macroalgae, and on corals and their mounts. These can even be imported simply through adding water from an existing system. As probably the most commonly seen as well as easiest to see of the group, the amphipod is also an important food source and scavenger in the closed system. The rear segments of the thorax and the front segments of the abdomen. 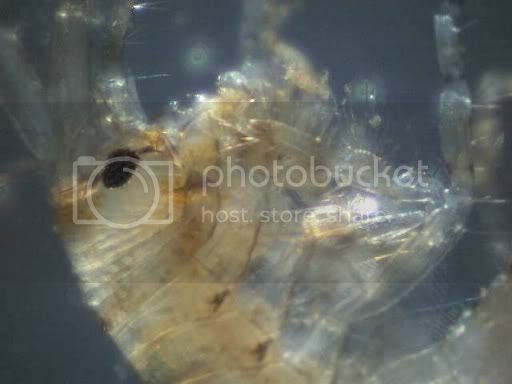 Notice the large walking legs which are hiding the much smaller pleopods.An amphipod has its body divided into three main segments, the head, thorax, and abdomen. The head itself contains the eyes and antennae and is a single part. The thorax is divided into seven different thoracic sections, each of which has a pair of walking legs attached to it. The abdomen has six different segments, the first three having pleopods (often referred to as swimmerettes) and the last three having uropods (basically rigid rods sticking out of them). The first two pairs of walking legs have been modified into pincer like legs which allow the amphipods to grab and hold food. They have a flattened body shape which is laterally compressed, meaning it is flat from side to side as are most of the fish that we keep. All of the anatomy aside, what you'll most likely see is a creature that is perhaps 1/4" at most in your aquarium that scoots back and forth on its walking legs or swims in a sideways fashion for cover when rooted out of its hiding place. 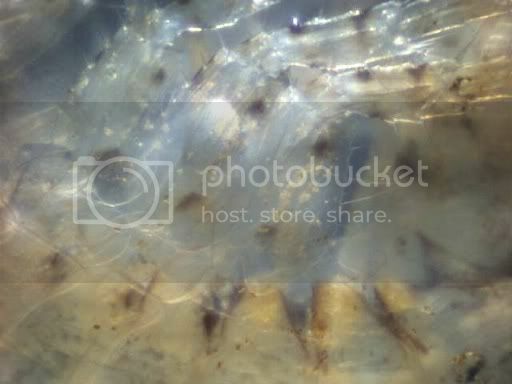 The head of the amphipod has a somewhat large eye. The eyes are said to bulge out more when the animal is mature enough to reproduce.Amphipods have a variety of different feeding habits which range from scraping algae or bacteria off of surfaces to embedding themselves into the sides of whales and feeding on the skin of the whales, but the ones we commonly see are detrivores/detritivores, which essentially means they eat detritus and are part of a healthy clean up crew or scrape up algae and bacteria. At the same time they are cleaning up our tanks, however, they are also feeding the other inhabitants as well. They are a favorite food of most fish, but this is also why they stay predominantly hidden during the day and are more nocturnal.So, all of the science aside, do we want these in our tanks? Yes, of course you do! Just like any other creature in our reefs, a healthy population of amphipods will help keep your system balanced. As a valuable member of the microfauna of our closed systems, they help to balance things out and are an integral part of maintaining a healthy marine aquarium through natural means. Well written Dave. These amphipods also eat the brown and red mats of cyanobacteria that sometimes appear in our tanks so they are very beneficial animals.